It is spring, and all the bears are out except one. Short Tail decides to go find the one they call the Great Bear. He quickly tries climbing the mountains and goes to sleep, where he often finds the Great One in his dream. The Great One is so impressed by Short Tail's respect, that he shares an important secret. 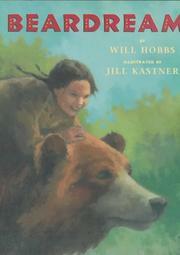 Hobbs, Will, “Beardream,” Children's Picture Book Database at Miami University, accessed April 24, 2019, https://dlp.lib.miamioh.edu/picturebook/items/show/6622.